How to disable the Saturdays and Sundays from the Calendar Control in ASP.NET. The Calendar Control is the part of ASP.NET web controls collection. It is one of the important controls in ASP.NET. The Calendar control belongs to System.Web.UI.WebControls namespace. By natures it provides to the web user to select the date in desired format. We can disable the Saturday and Sunday from the Calendar control in ASP.NET. We have the day render event to disable the Saturday and Sunday from the Calendar control in ASP.NET. Today we are going to discuss how to disable past days in ASP.NET Calendar control and How to disable the Saturday and Sunday from the Calendar control in ASP.NET. The DayRender event is a most useful event in ASP.NET calendar control. This event fires when the calendar is fist rendered on the screen. 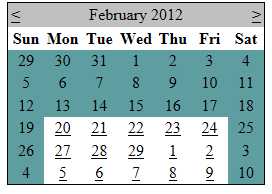 This will happen as loop for all the dates in the Calendar control every day. If you want to customize dates in Calendar control you need to write the code in DayRender event according your requirement. Today we are going to see how we can disable or block the past dates and Saturdays and Sundays in your Calendar control. From the above code, I added one Calendar control to ASP.NET page and called the event OnDayRender from it. Based on the e.Day.Date property I am disabling the dates. The Output is like as below. 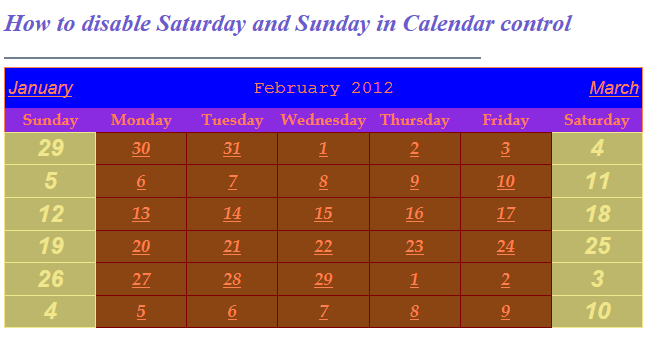 We can disable the Saturday and Sundays only from the calendar, below is the code to do that. The above code output is like as below.